The Supreme spa is the flagship spa of the Viking line of innovative spas. 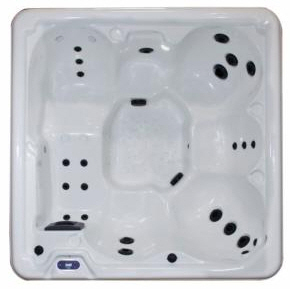 The spa for every family budget ... With it's roomy 5 to 6 person seating, lounger and Vikysage seating it is truly an exceptional value in the Viking �Affordable Hydrotherapy Experience�. Examine the features: Assorted adjustable and pulsator jets strategically located to comfort and soothe every part of your body. An oversized pump which creates exceptional hydrotherapy action and colored mood lighting for complete healing and relaxation of the mind and body. You deserve to own a Viking Supreme spa!